Our plan was to be up early. We finally hit the road at 9:00AM - which isn’t particularly early. Zaya was keen to hitch a lift, while I wanted to drive. We compromised. We stood around with our thumbs out for a bit and then drove on to the next town. The PanAm Sur was all but empty as we sped along through the morning’s sea mist past smelly egg hatcheries and oddly abandoned buildings. 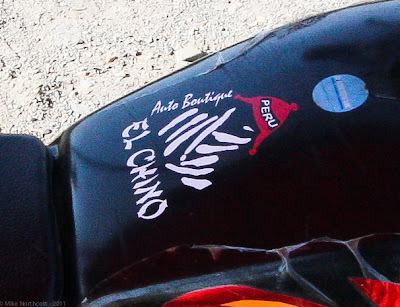 Our first stop in Chincha Alta was the loo, followed by an oil change and lunch. Zaya agreed to keep driving as long as we found a replacement for the rear view mirror Leo had whacked with his head in Tarapoto. Understandably she was uncomfortable with not being able to see over her left shoulder. I had by this time resolved myself to instant death directly from the front or the side, and had pretty much given up looking backwards. The lads from El Chino Automotive were very happy to see us. They plastered our mototaxi in stickers and took lots of group photos with the crazy Chinita and the Gringo. Plus they had what we needed in the mirror department. And I had to admit it, Zaya was right: life was better and safer with two mirrors. The bit again between our teeth we headed back south along the PanAm, although now it was simply another bumpy road. Speeding through a peaje (a toll booth from which we were exempt) we grew confident and set our sights on Ica. The sun was warm. Sand and low hills stretched out for miles around us. Dry arroyos left a few shrubs at the corners of the occasional corral. A vulture circled far overhead. All the scene needed was the twang of a steel guitar, a few pieces of tumbleweed and stranger on a horse riding the ridge. “Kerpling! Kah-flingah! Plank-ety Plank!”, yelled the engine. “What the…?” “Uh-oh!” Horrible clanking and grinding noises emanated from the motor that suddenly had no ability to generate forward motion. Unsure if we’d dropped the piston, the clutch assembly, or the transmission into the oil pan, Zaya immediately shut down the motor and we bounced quietly to a halt and paused to catch our breath. This was the moment I capitulated and accepted that we were done driving ourselves. Our only option was another lift to another town to another repair shop. Off in the distance the vulture cawed to its partner.